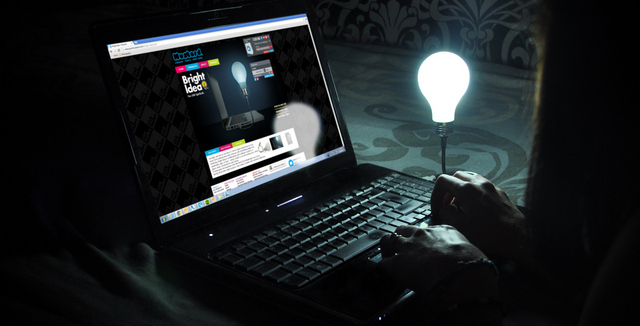 Have you been caught in the dark with no other available source of light than your laptop? Have you ever thought your computer’s brightness isn’t enough for you to see beyond your screen? Well, it’s just practical to have something like the USB Lightbulb. Those who are looking for a gadget accessory that’s eye-catching, artsy, and relaxing, the Bright Idea USB Lightbulb is practically perfect. Its name is its exact description – a light bulb attached to a twistable body, and at the other end, a USB connection. It is a plain old light bulb without a shade or guard, and the body is comparable to a steel snake. Though simple, the USB Lightbulb has a myriad of uses. Weighing only 65 grams, the Bright Idea Lightbulb emits a cool, soothing blue light announcing your presence in the entire room once it has been activated. Plug it in your laptop or desktop during moments of inspiration to provide some comic relief for you and your officemates during work day, while letting them know that several ideas are going through your head. Use it to signify your presence in your work station, unplugging it whenever you go to the bathroom or during short breaks. In times of stress, you can stare at its light to make you relax and your burdens lighter. It may even allow your office a variation of a night light should you decide to turn off all the lights for a power nap. That’s because even if the USB Lightbulb is detached from a USB port, it still glows in the dark. 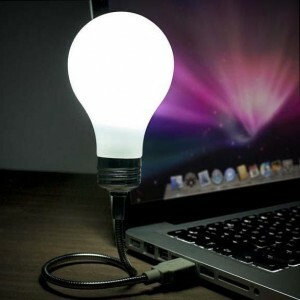 Well of course, you can also use this Bright Idea USB Lightbulb at your home. Save some electricity and turn off your light in your room. You can just simply rely on the light from this USB Lightbulb to act as your room lamp sans switches and legs. The light itself isn’t the only redeeming quality of the Bright Idea USB Lightbulb. In fact, its strong and flexible arm also provides hours of entertainment as you try to figure out which orientation is the best for stability and lighting efficiency. Because of its resemblance to certain wildlife, the Bright Idea USB Lightbulb also gives some play possibilities with your younger self in extreme moments of boredom. Although some would feel that Bright Idea is not really a necessity, they may find comfort with the thought that it retails for just under $18. With that price tag alone, Bright Idea USB Lightbulb is a great gift idea or a fun novelty item for your office or home. This entry was posted in USB Gadgets and tagged Bright Idea, USB gadgets, USB light, USB light bulb, USB lightbulb. Bookmark the permalink.